RnR PPTools - now, you'll find RnR's PowerPoint add-ins on this site - including the FREE Starter Set! 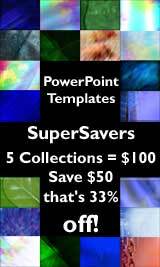 This page previews and links to all the PowerPoint template sets that are part of our ongoing, hugely popular medical series. All sets can be previewed as thumbnails - in addition, larger representations open in popup windows on clicking. Actual sizes of backgrounds are 1024 x 768 pixels. All sets are included as readymade medical PowerPoint templates as well - so that you can use them immediately after purchase and download.